There are so many tools and programs out there that claim to help you improve your online marketing. I’ve tried a ton of them over the years. LeadPages is my favorite tool for making landing pages, sales pages, upsell pages, really nice email subscribe forms, thank you pages, welcome pages, webinar registration pages, lauch pages, and more. 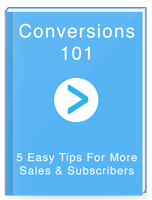 They have a ton of features already, and are always coming out with new ways to improve your website’s conversion rate. LeadPages is also extremely easy to use, no need for code or programming, and it integrates with almost any existing web platform, including WordPress. Of course, all the pages are nicely designed, and look great on mobile devices and tablets too. It’s worth watching their demo video to see what it can do. My favorite LeadPages feature is called “LeadBoxes” (I know, silly name). I actually use LeadBoxes on every page of this site. To see it in action, click the book over in the sidebar and you’ll see how it works. You get an email subscribe pop-up that you can attach to any link. So, instead of cluttering up your design with a bunch of subscribe forms, you can use a LeadBox instead. Pricing for LeadPages starts at $37 per month, so it’s not the cheapest piece of software out there, but if you’re actively building a business, it’s a no-brainer. You’ve probably noticed that I talk a lot about building “leverageable assets” in your business. One of the most important assets you can build is an email list. It’s 2014, and everyone knows this, so I won’t try to convince you that you need an email marketing program. I’ve used almost every email marketing program out there… Constant Contact, iContact, MailChimp, Infusionsoft, Aweber, GetResponse, 1ShoppingCart and a few that aren’t even around anymore. I currently use MailChimp and Aweber in my business. For Conversion Leverage and the Monthly Experiments Project, I switched over to using Aweber. I switched because Aweber does a lot of the nice things that MailChimp does, but also makes it easy to create email autoresponder sequences. I use that feature to build stronger relationships with my subscribers on those two blogs, and also to generate extra revenue on some of my other websites. I don’t think Aweber is as easy to use as MailChimp, but it’s still a lot easier to use than the other email marketing services I’ve used in the past. Pricing starts at $19 per month, and Aweber integrates nicely with most services, including WordPress and LeadPages. Crazy Egg is one of my absolute favorite services! It’s really different from a lot of the other tools out there. Crazy Egg lets you see how your visitors interact with your website, and shows you a “heatmap” of where people click. You can also see how far people scroll down your pages (this is especially important for sales pages or product pages). I use Crazy Egg to optimize my designs so that users are clicking where I want them to click. In fact, I’m using Crazy Egg on this very page, so if you click on one of the links, I’ll know. Spooky, right? 🙂 I’ll be sharing a case study and picture of my heatmap very soon, plus a step-by-step video of me setting up the service on this page. So, stay tuned for that. Until then, you can use the link below to get a special free 60-day trial and put it to use on your own website. Setting up the service takes less than 2 minutes, and if you have a WordPress site, you can handle the integration without touching a single line of code. (CrazyEgg.com) – Use this link to get a special 60-day free trial. I use WordPress to power all of my blogs and websites, and sometimes I get asked about which WordPress theme I’m using on one of my sites. I’ve used a lot of different themes in my WordPress development business, but I almost always use StudioPress themes on my own sites. This site is built on the new Enterprise Pro theme. I chose this theme because it looked good out of the box, had nice contrast between the background/design and the visual elements I wanted to stand out (like buttons and graphics)–that’s an important part of designing for conversions. Oh, and it’s mobile responsive, so it looks great on all devices. The Enterprise Pro theme is $100, and comes with the Genesis framework.